Chuuta Kokonose is an eighth grade middle school boy who lives together with his aunt due to the absence of his parents. Chuuta is a nice boy and excels in home economics, but lacks friends due to his low self-confidence and is viewed as a weirdo since he likes to talk to himself. From as long as he remembers, he has a voice in his head that constantly talking to him that often distracts him from his surroundings, which frustrates him since people misunderstands this as he's talking to himself. He is recruited into a Space Police Agency, ēlDLIVE, after he passed the entrance test with the help of the voice from his head, which is revealed to be one of the lost alien race Monitalien that he nicknamed Drew, that has been living within him. 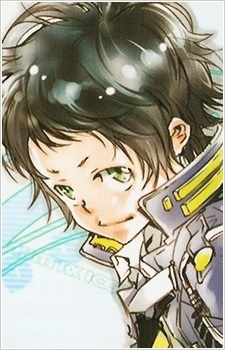 Even though at first he joined ēlDLIVE merely because of Drew's insistence and provoked by Misuzu's mockery, he eventually determined to continue his duty as ēlDLIVE agent for greater good. Since Drew shares body with Chuuta, Drew requires Chuuta's imagination to form himself into what Chuuta thinks in his mind to fight. So far, Chuuta creates their attacks based from his experience in home economic study. - Naminui (なみぬい, lit. Sewing): Chuuta used Drew to create a thread that binds the enemy. - Space Pheromone: Reikyaku Gamuhagashi (スペイスフェロモン 冷却はがし, lit. Space Pheromone: Peel Cooling Gum): Chuuta used Drew to unleash ice that freezes the enemy.